A collaboration between the Biblioteca Joan Triadú and ACVic Centre d’Arts Contemporànies, with the Regidoria d’Educació. During the school year 2017 - 2018, a number of workshops took place, in collaboration between the two local organisations. They took three different illustrated children’s books as their subject-matter: The Enemy, by Serge Bloch (Biblioteca Joan Triadú), The Steadfast Tin Soldier, by Jörg Müller (Biblioteca Joan Triadú and ACVic), and El Buit (The Void), by Anna Llenas (Biblioteca Joan Triadú and ACVic). 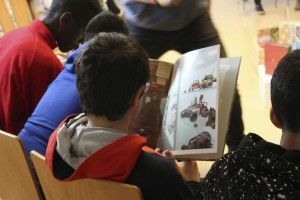 The workshops form part of the reading promotion programme organised by the Department of Education of Vic Town Council, the Joan Triadú Library and ACVic, as part of ACVic's Miniespai projects. First Year students attending secondary schools in the town of Vic were welcome to participate in groups. In this case, first year secondary school students from the Col·legi FEDAC Pare Coll, the Col·legi Sagrat Cor de Jesús and the Institut La Plana took part. The picture-book The Steadfast Tin Soldier, by Jörg Müller, is based on Hans Christian Andersen's story of The Lead Soldier, but the author has moved the action to the present day, in a tour of various countries. This book was used to teach the interpretation of images, and as a starting point for debates on globalisation, ecology and the waste of resources, and tourism, as well as in classroom activities discussing point of view, narration composed of sequences of images, and hyper-realistic drawing styles. In El Buit (The Void), Anna Llenas deals with a girl’s sense of emptiness when she changes home, her friends, her surroundings, and how she learns to live with and finally overcome this feeling of sadness or nostalgia. Activities consisted of a group reading of the picture-book, a debate about the book’s theme, and an interdisciplinary practical activity using artistic and physical expression.